Using a bank or a money transfer company to “wire” funds electronically is an easy and convenient way to send cash to someone. And when consumers wire money to people they know, the transaction typically takes place without a problem. But wiring money to strangers — in the U.S. but especially in another country — is risky because often they could be scam artists. Never wire money to people you don’t know, regardless of how convincing or enticing their story may be. Scammers often win their victims’ confidence with some “bait,” such as a work-at-home offer, a great deal on a product for sale, or news that you have won some kind of lottery. Be especially careful with transactions over the Internet, where the other person’s true identity can remain anonymous. “A stranger asking you to wire money is a huge red flag that it is a scam. Don’t fall for it,” said Kathryn Weatherby, an FDIC Fraud Examination Specialist. But even if you get a request to send a wire transfer and it’s supposedly from someone you do know, confirm that’s the case some other way, such as through a separate phone call. Walk away from any offer from a stranger who asks you to deposit a check into your bank account and instructs you to wire any of that money to someone else, perhaps in another country. Let’s say you receive a check, cashier’s check or money order for an item you are selling or to cover so-called processing fees, shipping costs or other expenses. But then you notice that the check is for more money — perhaps far more — than what you were expecting. The other party instructs you to deposit the check and wire a portion back to an associate in another country. Later you find out that the check was fake and you are out all of the money you wired. 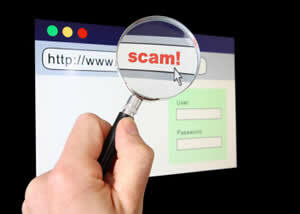 In this type of scam, victims may end up owing thousands of dollars to the financial institution that wired the money. Likewise, if you are selling something online, be wary of a request by a “buyer” to wire you the money because that may be a ruse to get your bank account information. Or, this person may plan to send you the money illegally using someone else’s bank account number, and ultimately you’d be without your merchandise as well any payment. “Always remember that wiring money is like sending cash, and because you voluntarily sent the money, you have fewer protections in terms of getting it back,” Benardo said. Never give out your bank account or credit card numbers in response to an advertisement or an unsolicited call, text message or e-mail. That information could enable someone to steal money out of your account by a wire transfer, before you have time to realize that the interaction was fabricated by a swindler.